Just in time for the holidays, more than 18 Maryland families recently were awarded an early Christmas gift. Each family was given the opportunity to purchase a badly needed car through the work of Vehicles For Change (VFC). The program awards vehicles to qualified low-income families with guaranteed low-interest loans, allowing them to build credit while completing the car ownership process. 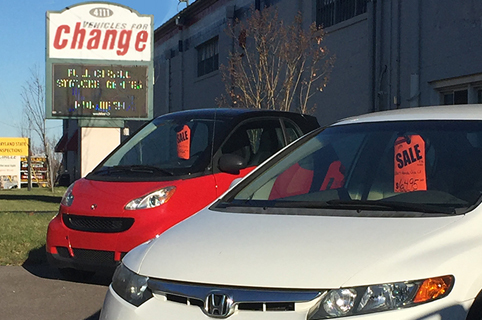 “Vehicles For Change is about helping low-income families with transportation so they are able to get to work, get to their doctors appointments and get their children to school,” said Marty Schwartz, Vehicles For Change president. Without reliable transportation, it can be very difficult for individuals to find and maintain employment, which makes it tough to provide for their family. Through VFC, four to five hundred cars are awarded to low-income families each year. To date, more than 6,000 cars have been awarded to low-income families, changing the lives of more than 21,000 people. It started with a $20,000 grant, a $10,000 loan, two employees, two cubicles and some auto parts. Today, it has flourished into the purchase of a 33,000-square-foot building that is now the headquarters of Vehicles For Change. Since its beginning in 1999, Vehicles For Change, a nonprofit organization, has been the driving force in impacting the lives of low-income families, as well as men and women who are returning to society from incarceration. The organization empowers families experiencing financial challenges to achieve economic and personal independence by providing car ownership and automotive training. VFC receives a major portion of its car donations from the public. The cars are repaired to meet all quality standards and awarded for as little as $900 to eligible families that are referred by partnering agencies, such as the Center for Urban Families, Living Classrooms, Our Daily Bread and the Department of Social Services. All vehicles carry six-month, 6,000-mile warranties to ensure they stay in good working condition while recipients get back on their financial feet. “Providing transportation and automotive job training is an effective way to help our communities and our economy as well,” said Séson Taylor-Campbell, PNC relationship manager and Vehicles for Change advisory board member. Supporting underserved communities and ex-offenders entering the workforce are ways we can help people and our communities thrive. In 2015, Full Circle Auto Repair and Training Center, a subsidiary of VFC, opened a 10-bay auto repair shop offering a wide range of services at a discounted rate. 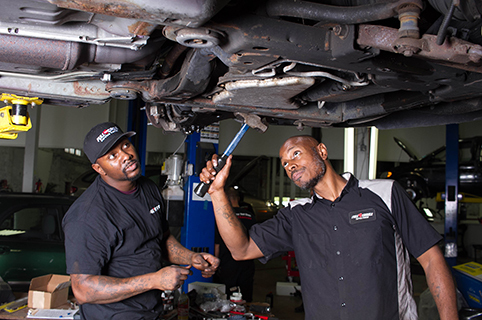 Full Circle Service Center also serves as a prison re-entry program, training men and women recently released from prison to become auto mechanics. The program prepares them for Automotive Service Excellence (ASE) certification and eventual employment in the automotive industry. Men and women in the program repair donated vehicles to be sold to eligible car award recipients. After building a sustainable car award and automotive training program in Maryland and Virginia, VFC took its first step toward national expansion by opening a second location in Detroit, Michigan in 2015. Future locations are planned for Prince George’s County, Maryland and Flint, Michigan.